What a delightful book! I worked on this book primarily with Wendy, my 6 yo dd, but my others listened in and participated a bit. This book goes through a week of learning about and worshiping God with various aspects of our being. Wendy was very receptive and we had some great discussions. The ideal, in my opinion, way to use this book is to read the story through each day from Sunday to the following Sunday. After reading the story through each day (it’s a fairly short read and repetitive so the kids can join in – Bonus! ), there are discussion questions, scripture references and various activities to complete. The thing I most appreciated about this book is that the discussion is fairly open-ended. Being Eastern Orthodox, we, obviously, have our own teachings about Heaven and forgiveness, etc. The discussion questions were not pointed to one particular variety of Christian, so I was able to use the book as is without having to make any changes to accommodate an Eastern Orthodox worldview. The questions and activities facilitated several great discussions for our family. Good Morning, God is a hardback book written by Davis Carman, illustrated by Alice Ratterree, and published by Apologia Press. You can order your own copy of this book for $14 directly from Apologia. There is an accompanying coloring book that you can order for $4. 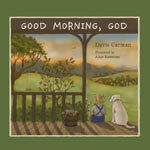 Apologia has kindly made a sample chapter of Good Morning, God available for you to see here. I really appreciate the learning and discussions that this little book brought about for our family. I highly recommend this book to all parents with young children.